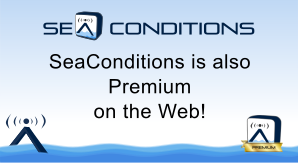 SeaConditions is a unique and fully integrated access point to the meteorological and oceanographic forecasts for the Mediterranean Sea. Scuba divers, freedivers, surfers, kitesurfers, fishermen, sailing enthusiasts, beach tourists and anyone else who enjoys sea, can find the best sea forecasts for 5 days ahead with a frequency of 3 hours for the first 2.5 days and of 6 hours for the following days. This weather forecasting service combines the effort of skilled researchers in weather and oceanographic forecasts with the latest developments in Information Technology. The high resolution sea forecasts include: sea surface temperature, surface currents, significant wave height, wave period and direction. The weather forecasts include: air temperature, surface atmospheric pressure, precipitation, cloud cover, wind at 10 meters. Daily satellite observations of chlorophyll concentration and water transparency are also available. In future updates alerts of weather and sea conditions in your favourite locations will be provided as well as personalized weather reports. SeaConditions officially supported the sailing teams of several regattas including the 30th and 31th Brindisi-Corfù race, the Rimini-Corfù-Rimini regatta and the America's Cup. - monthly subscription for € 2,99 (auto-renewable). - five-days and personalised forecasts for the Mediterranean Sea. In addition, synoptic views are available on mobile devices for a summary presentation of forecasts. The free version of the app shows the forecasts for the next 24 hours, while the premium version, also available on the web (http://www.sea-conditions.com), shows the forecasts for 5 days. Send us your feedback at info@sea-conditions.com to help improve our service.